If you have a child with special needs, you know those needs extend beyond the controlled confines of your home and child’s school. Everyday trips to the grocery store and neighborhood park may carry special challenges. Visiting a busy museum can quickly overwhelm a child with sensory issues, and a typical playground might be useless to a kid who gets around with the assistance of a wheelchair. I’ve been there, and as parent to a child with an autism spectrum disorder, I feel strongly that kids with disabilities deserve more options when it comes to fun outings. Fortunately, the number of destinations catering to the unique needs of children with disabilities is growing all the time! We’ve gathered several indoor and outdoor outings in the Seattle region that accommodate and even cater to children with special needs. 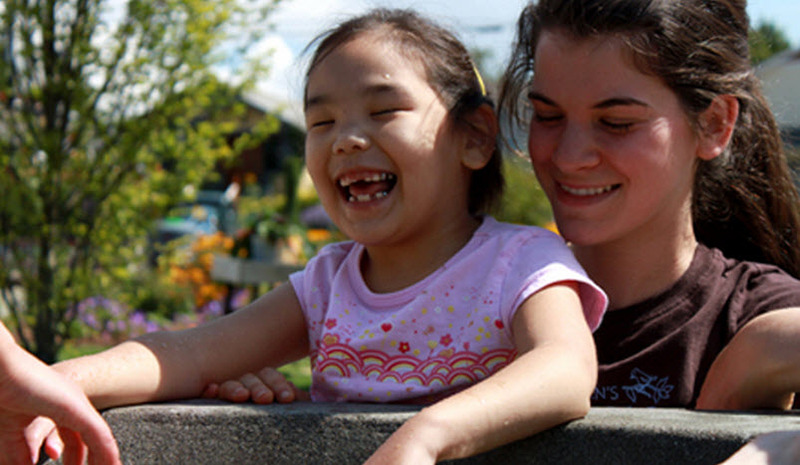 All children deserve an opportunity to play, and making that possible for kids with disabilities and special needs is the mission of the Seattle Children’s Playgarden. 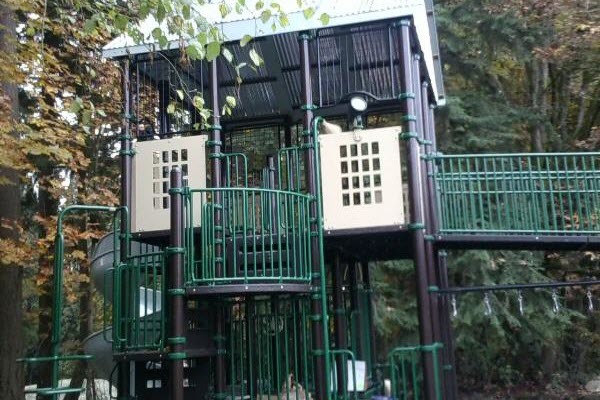 This fully-accessible public playground engages kids with Down syndrome, autism, cerebral palsy, hearing or vision impairments and other disabilities in ways a typical playground does not. There’s a real veggie and flower garden to dig in and explore, chickens in a coop, a tree fort and musical sculpture, a foam play area and rock scramble, indoor learning facilities and more. Everything is fenced in (a huge relief for parents of kids of the autism spectrum). Like most public city parks, the playground is ADA-accessible but takes the concept of accessibility a step further as it was designed specifically with kids in wheelchairs in mind, from countertop heights to playground equipment. Even the treefort is wheelchair accessible. Evening classes are also offered quarterly: Choir class is free, and kids can join the Art with Arnie class with a suggested art supply donation. Hours and cost: The Seattle Children's PlayGarden is a public park, and is open to the public from sun up to sun down year round, with the exception of during summer camp hours. Check the calendar for current hours and class schedules. Pacific Science Center offers its Exploration for All: Autism Early Open typicall the third Saturday of each month from 8–10 a.m., before the center opens to the public. Attendance is limited, lighting is softened and the noise level and visual stimulation on interactive exhibits is decreased wherever possible. They will also have staff on hand who are specially trained in inclusive communication and understanding accommodations for people with disabilities. They also provide additional captioning devices in one of the IMAX theaters and printed copies of our sensory guide for guests—including maps of exhibit spaces rated for noise level, visual stimulation, availability to touch and feel and strong odors. Additionally, the museum has several guides to help children on the autism spectrum enjoy the experience, including a sensory guide that helps families identify specific exhibits that meet their sensory needs, from noise level to visual stimulation, and points out quiet areas available for breaks. The center also gives hand stamps for same-day re-entry should your child need a break away from the building. The general exhibits and both IMAX theaters are fully ADA accessible, wheelchairs are available to borrow at no cost, and aides are free when accompanying a guest with a disability. Hours and cost: Admission is $11.95–$21.95. Regular hours are Monday–Friday, 10 a.m–5 p.m. and Saturday–Sunday (and holidays), 10 a.m.–6 p.m.
Sensory story times are hosted periodically at different branches of the Seattle Public Library. Registration is not required but is limited to 12 families on a first-come, first-serve basis. These special librarian-led story times are for kids ages 10 and under who have a hard time in large groups, are on the autism spectrum, or are sensitive to sensory overload. The librarians read preschool-level books, and also engage the kids with songs and movement so it’s appealing for children who prefer not to sit still for long. Each storytime follows the same format and the library provides a visual schedule to familiarize your child with the program. Cost and hours: Free, see website for dates and times. Up to 12 families are welcome on a first-come, first-serve basis. 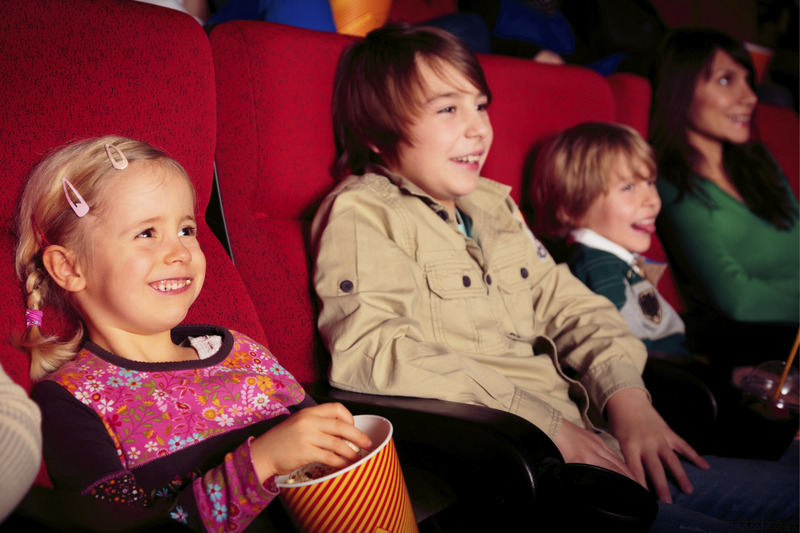 AMC Theatres has partnered with Autism Society to bring special Sensory Friendly Film showtimes to locations across the country, including four in Western Washington: Lakewood, Kent, Woodinville andBurlington. At these showings, auditoriums will have their lights up, the sound turned down and audience members are invited to get up and dance, walk, shout or sing. Cost and hours: Price and times vary by theater. Screenings are typically at 10 a.m. on the second and fourth Saturdays of the month for family -friendly fare on Saturdays and 7 p.m. on select Tuesdays for movies that appeal to older viewers. Current movies and showtimes are listed here. Check your local theater before attending. Movie times are often not updated until the current week. Showtimes will be marked with "SFF." 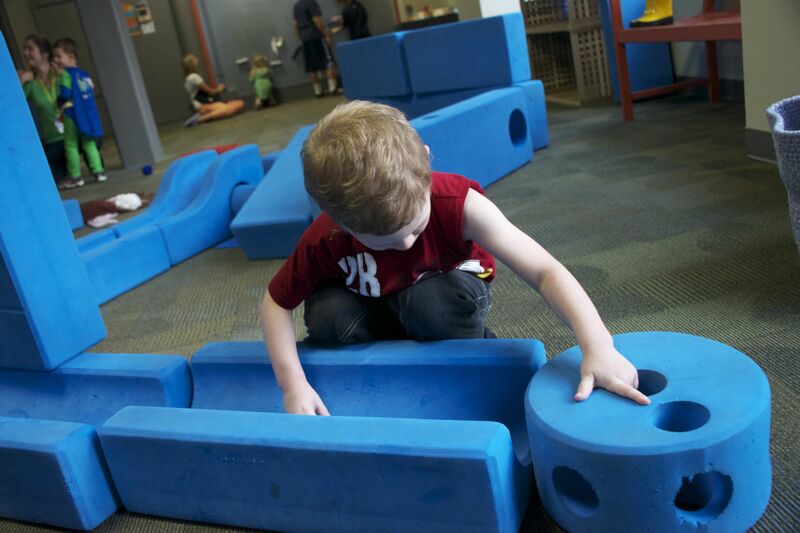 The Children's Museum of Tacoma invites familis of children with special needs to play at the museum every Tuesday, 10–11:30 a.m., in its program called Tuesday Play Days. Admission to the museum for this program and everyday is pay-as-you-will. Parents will love the opportunity to network with other families. Kids will love the chance to have a sensory-friendly and supported play experience in the museum galleries with trained museum staff and volunteers. Cost and hours: Admission to the museum is pay-as-you-will; no reservations required for this program, just drop in. Miner's Corner, Snohomish County's first universally accessible park, opened in 2013. The park emphasizes a full sensory experience in natural surroundings, and plenty of adventure. It meets requirements for full storm water dispersion, which means at least 65 percent of the site is natural vegetation. The park makes use of this natural beauty by placing the playground right in the middle of the woods, and has numerous play spaces set along park pathways. A intermittent stream and wetland encourage mesmerizing water play and interaction with nature. Cost and hours: Free, Open daily 7 a.m. to dusk. Note: Snohomish County Parks practice a "pack-it-out" garbage philosophy to conserve resources, so plan to take home your snack wrappers as there are no garbage cans. Every fourth Sunday is Sensory Sunday at KidiMu, Bainbridge's fabulous, hands-on children's museum. The program is offered in the morning prior to opening to the public. Kids will enjoy a less crowded environment as well as therapist guidance. Advanced registration is recommended. KiDiMu also periodically offers "Sensory Kid's Night," a drop-off program where potty-trained kids with autism or a similar sensory processing challenge ages 3.5–12 enjoy a therapist-led, fun-filled evening at the museum and parents can enjoy some free time. Check website for upcoming events. Cost and hours: $8/person; members free. Sensory Sunday is held every fourth Sunday from 10–11:30 a.m.; families are welcome to stay and continue exploring the museum during regular hours. Please register in advance at: 206-855-4650 as space is limited to provide the best experience for visiting families. Walk-ins welcome, if space available. Hands On is the largest children's museum in the Pacific Northwest. It has a sensory-friendly story guide available and hosts Special Mornings of Play for families with kids on the autism spectrum or with other special needs. In addition, the front desk has brightly colored noise-muffling headphones you can borrow for free during regular museum hours. Sensory-friendly exhibits include the "The Good for You" gallery, which has a garden that kids can harvest in summer and the "Move It!" gallery, where a wind tunnel, flying and building station, and 25-foot air maze encourage physical play and gross motor movement. Finally, explore the Outdoor Discovery Center's hiking trail, lighthouse lookout, working garden and naturalist cabin. Cost and hours: Special Mornings of Play: $8, under age 2 free. Low-sensory evenings at KidsQuest are a special time just for kids with sensory sensitivities to visit the museum. 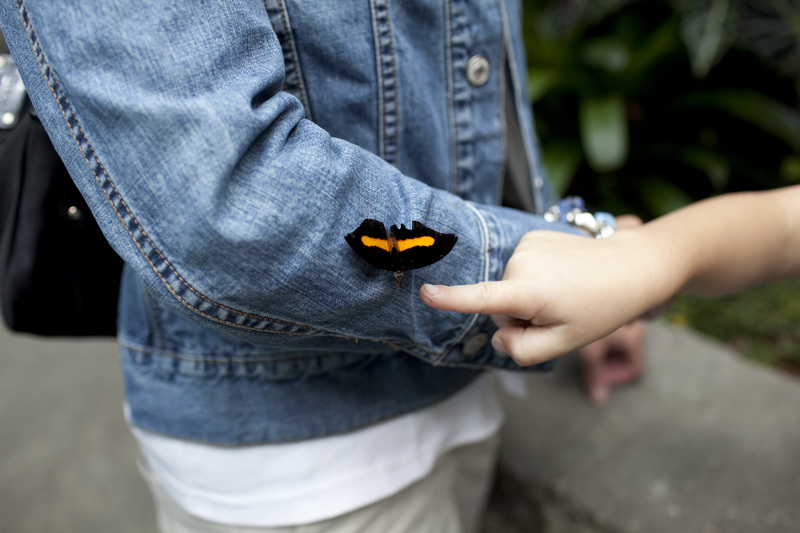 KidsQuest turns down the noise and lights and limits attendance so kids can explore freely without distractions. These evenings are especially appropriate for children with autism and/or Sensory Processing Disorder, but low-sensory evenings are open to children with any type of special need and their families. Cost and hours: Low-sensory evenings typically occur the first Wednesday of the month. Check the calendar for upcoming dates. Free; advanced registration is required. 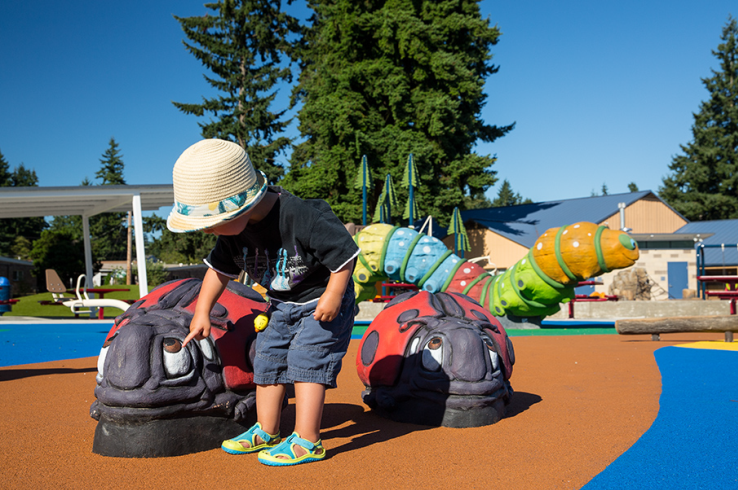 This newer playground in Renton was designed to be accessible and fun for all ages and abilities. It sits next to Meadow Crest Early Learning Center, home to an inclusive preschool, and North Highlands Neighborhood Center. Features include oversize musical instruments, an interactive water table, a nature play area with logs and sand, and a wavy walk for wheelchairs or tricycles complete with a play gas station and stop signs. Cost and hours: Free and open to the public all day on Fridays and weekends, and after 4:30 p.m. Monday–Thursday. The park is also open every day during the summer and on holidays when preschool is not in session. Sensory Jump is held in the evenings on the second Tuesday of the month. During this time the play areas are reserved for children on the autism spectrum and their families. Jump, slide and play with sensory-friendly games in a safe and controlled atmosphere. Cost and hours: $8 per child and $6 per sibling (plus taxes). Second Tuesday of each month 6:15–7:30 p.m.; reserve online. The second Monday of the month is exclusively for special-needs participants and their family and friends. On these evenings, Elevated Sportz turns down the music and provides a safe and comfortable environment for exploration of physical abilities on trampolines and in the Kidz Adventure soft play structure. Cost and hours: $8 for special-needs participant and one parent (or aide) jumps for free. Siblings and friends $8. Every second Monday of the month, 6–8:30 p.m. This beloved, inclusive park is fully ramped with a padded play surface and offers music play, accessible swing seats, lots of ground-level play and shade structures. Take a nature break and stroll a walking trail, visit the lake or have a picnic. The only downside is an abundance of goose droppings on the grass areas due to the close proximity of the lake. Cost and hours: Free, open to the public daily, 6 a.m.–10 p.m.
Editor's note: This article was originally published in 2013 and most recently updated in 2018.